Hiking is extremely popular in New Hampshire and the Pemigewasset River corridor has many miles of pristine trails to explore. Before there were roads, there were trails cut through the NH wilderness by hunters and trappers looking for new resources. Today many of those trails still exist, mostly maintained by local organizations and government departments. They are excellent for hiking and exploring all that nature has to offer. The headwaters of the Pemigewasset River begins in Franconia Notch State Park, filled with dozens of great hiking trails that attract thousands of people every year. The popular Pemi-Trail has spectacular views of Cannon Cliffs, Profile Lake, The Basin and the Pemigewasset River. You can easily access the Pemi-Trail in four places: the Old Man Historic Site (Exit 34B off Route 93) right parking lot, the parking lot south of Profile Lake, the Lafayette campground parking Lot, or the parking lot at the Basin. Another popular hike is the Mount Pemigewasset Trail, which starts from the Flume Gorge to the top of Mount Pemigewasset, also known as Indian Head. The east branch of the Pemi River runs near the Pemigewasset Wilderness, which has the infamous Pemi Loop. It is a series of interconnected trails covering up to 12 mountain peaks each over 4000 feet high. For this reason it was named the second hardest day hike in America by Backpacker Magazine. Some of the hiking trails are good for a short day trip, or try the entire loop for a serious multiple day hiking excursion through the majestic White Mountains. 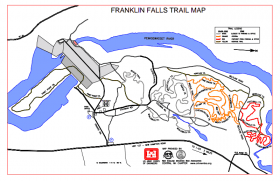 The southern Pemi ends near the Franklin Falls Dam recreation area, with 3900 acres to explore. There is a nice walking road out over the dam itself with some great views of the Pemi River and flood plains below. The overlapping trail system there is mostly maintained by volunteer members of the New England Mountain Bike Association but these well graded tracks are useful for hiking as well. 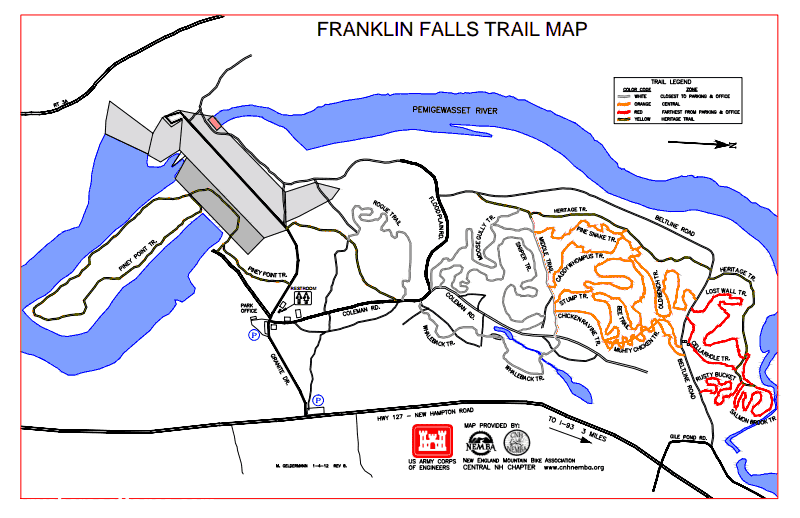 Franklin Falls Dam is only a few miles south of Route 93 exit 22 so it is easy to reach from most areas in NH. Pemigewasset River Hiking article by Pemi Shore Cottages.